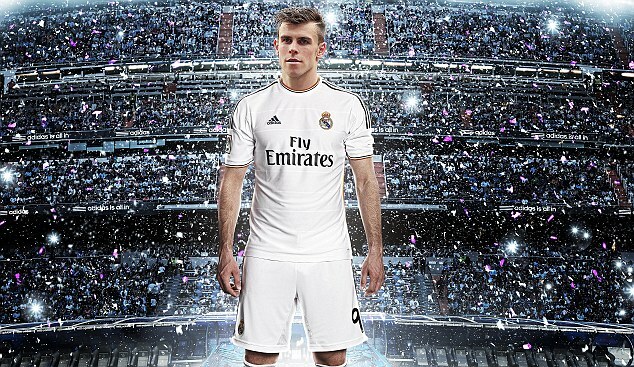 Is Gareth Bale's head being turned by Real Madrid? Star quality: opportunity of a lifetime. It seems after weeks of harmony at Spurs, Gareth Bale is now looking to make the leap to Madrid. But will it happen? Those with a long-term memory for detail at Manchester United might favour showing Wayne Rooney the exit door after talks with David Moyes. Sent home with a hamstring injury just 24 hours after his arrival on the club's preseason tour, Rooney's Old Trafford career's dipped to a new low. Back home, the England striker's "angered and confused" about his future after Moyes hinted he'd not be first choice. Moyes insists he "has a major role to play", but "if for any reason we had an injury to Robin van Persie we are going to need him. I want as many options as possible." United executive vice-chairman Ed Woodward underlined the stance by declaring no fear in allowing Wazza's contract to run down. But what if Chelsea's overtures to sign Rooney become deafening? The tone of the tough talk might then lighten at Old Trafford. Jose Mourinho's already confirmed his first bid has been rejected, but strenuously denied offering Juan Mata and David Luiz as makeweights in the deal. Rooney's dispute is 'afters' over the transfer request he slapped in nearly three years ago when declaring the club lacked ambition. Remember the saga in 2010? How thickheadedness threatened to put a foot through everything of value in his life; his relationship with Sir Alex Ferguson and wife, Colleen? I wrote about it furiously - THRICE. here, here and here! 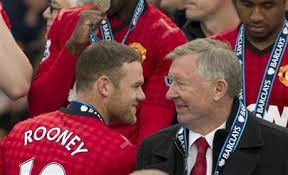 I was right to think settlement between Fergie and Wazza was a ticking timebomb: that Sir Alex Ferguson had re-signed him, figuring Rooney was valuable to the team even if he had to break his own rules about tolerating such behaviour from one of his players. Peace broke about between them back then but came at the expense of a distance, a coldness between the pair. Their handshake on the pitch as Fergie waved goodbye to management was much less warm than those shared with Giggs and Scholes. Bridges built look to be burning down. Three years on and United can cash in on one of their main transfer assets without losing value to Bosman. But the club insists it's not rushing to sign an extension to his deal despite just two years left on it. Neither is he for sale. The message is clear from new boss David Moyes: play yourself back into contention. Robin van Persie is the 'main man'. Now Rooney has to build bridges with Moyes, with whom he has a rocky past, including a libel suit that resulted in an apology from Rooney and a reported £50,000-£150,000 settlement for Moyes. 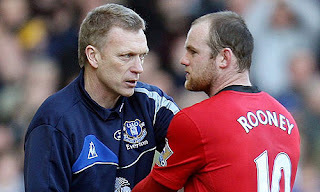 In his 2006 autobiography "Wayne Rooney: My Story So Far," Rooney accused Moyes of leaking the details of a conversation they had while they were both at Everton in 2004. Rooney wrote that he told Moyes he wanted out of Everton after tabloids caught him visiting a prostitute. The next day the Liverpool Echo ran a story about the conversation, and Rooney wrote in his book that Moyes was the one who spilled the beans. After the book came out, Moyes sued Rooney, HarperCollins, and co-author Hunter Davies for libel — saying the accusation that he threw Rooney out was "wholly untrue." In 2008, the suit was settled before a trial. Rooney "sincerely apologized" and paid damages and legal costs worth £500,000, according to the Guardian, £50,000-£150,000 of that is believed to have gone to Moyes. Despite Rooney insisting his battle with United in 2010 wasn't about money - more a lack of ambition at Old Trafford, United gave him a contract extension and a massive pay-hike. But as Rooney and his representatives consider what to do with New United, perhaps they should be armed with the words of Roy Keane ringing in their minds. Plain-speaking Keane, who's twelve years at Old Trafford ended after a spat with Sr Alex in 2005 said, "I would tell Wayne, who's a good lad, to make sure he looks after number one. "Players are pieces of meat. When your time's up, it's up. Luckily for Wayne, he's at a good age and he's fit". Keano's falling out with Fergie was at the end of his career - a few months at Celtic proved his swansong. The first years of Robin van Persie and Shinji Kagawa plus the emergence of Danny Welbeck, put unprecedented pressure on Sir Alex's then 'main man'. His £10m a year wages plus United's inevitably daunting asking price puts paid to pretty much everyone's interest. As with every top player in crisis, the only way to emerge better is to play yourself back into contention. Chelsea have emerged from the bushes like speculative hunters and despite his baggage, Rooney would be quite a trophy bagged. Jose Mourinho can smell an opportunity. He's said England would be affected by a Rooney who wasn't first-choice at Old Trafford, hinting he could be the main man in blue. Despite the talk, United may well be warned by Chelsea's interest to insist he's not for sale, then listen to eye-watering offers for his services at a time to suit them. Star quality. Remember the name. Kevin Hatchard, who works with me at Sportsmedia believes Liverpool will need to work extra hard to attract big-names who can now choose to join Champions League clubs instead. Liverpool boss Brendan Rodgers has spoken in reverential tones about the way Borussia Dortmund have transformed themselves from a club on the brink of financial collapse to one that came within a whisker of winning European football’s greatest prize. It is therefore ironic that Dortmund have gazumped Liverpool for their primary transfer target. Armenian playmaker Henrikh Mkhitaryan has completed a switch from Shakhtar Donetsk to the Ruhr-based club for 25 million euros, and Rodgers must now look elsewhere in his efforts to add more firepower to Liverpool’s ranks. Although the Mkhitaryan deal was extremely complicated (he was owned by three parties – Shakhtar and his previous teams Metalurg and Pyunik Eriwan), Liverpool’s failure to land the player perhaps demonstrates the difficulties that Rodgers now faces. Mkhitaryan actively pushed for a move to Dortmund, but he did not even meet with Liverpool’s representatives. 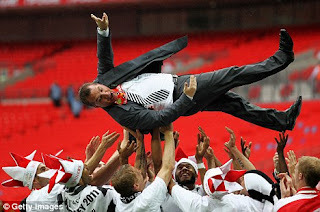 In terms of development, the Germans are some way ahead of the Merseysiders in their recovery – Dortmund have won the Bundesliga title in two of the last three seasons and were Champions League runners-up, while Liverpool have no European football to look forward to this term, and haven’t managed a top-two finish since 2009. For what it’s worth, I think Rodgers is doing an excellent job. He has given Liverpool a clear tactical direction, and he is fitting players to that system, rather than trying to clumsily adapt his footballing philosophy to the players he already has. He has managed to convince promising young talents like Phillippe Coutinho and Daniel Sturridge that Liverpool are a good bet long-term, even though the move to Anfield will cost them Champions League exposure in the short term. However, it’s worth bearing in mind that although both players have impressed since joining the Reds in January, neither had fulfilled their potential until that point, and as such were not highly sought after by Europe’s big hitters. This is the furrow that Rodgers and his much-vaunted transfer committee must now plough – players who have the technique and temperament that Rodgers demands, but aren’t dazzled by the bright lights and fiscal incentives of the Champions League. Liverpool aren’t signing players who are at the peak of their powers. Iago Aspas, Luis Alberto and Simon Mignolet are all excellent young players with room to grow, while Kolo Toure is on the downward curve but has huge experience. These are all fine signings, but Liverpool fans will have to be patient. The Premier League title is simply out of reach, with Chelsea and the Manchester clubs all bristling with proven talent. That doesn’t mean Liverpool supporters should despair, it just means they will have to accept that a tilt at Champions League qualification is the primary target for this campaign. Just as Dortmund did, Liverpool will have to make gradual improvements year on year under the guidance of a charismatic coach. Rodgers is right – Dortmund have shown what can be achieved. It just might take a little while longer than some Liverpool fans are prepared to wait. How much was Fergie worth to United's success? 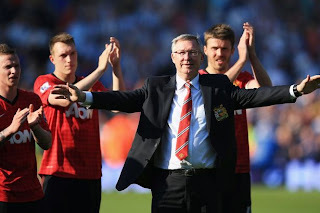 The 3D personality of Sir Alex Ferguson dragged an average Manchester United over the line and the difference in points between last season and this will tell us the exact worth of all the inspiring, cajoling and intimidating. United fans are putting on a brave face but worry lines will appear once it becomes apparent the control Sir Alex exercised through results no longer exists. There will be no Moyesy-time, no banning of reporters, no imagined injuries preventing players joining up with national teams - and there will be no title. After 26 years of bullying, match day officials must feel relieved. No longer will a game at Old Trafford be one to be dreaded and they can do their job without fear of private admonishment or public ridicule. The new man can tap his expensive watch all he likes but he has won nothing and his histrionics will count for little. Journalists, too, will be able to ask a reasonable pre-match question without the prospect of a bollocking or a ban. After games the written press and media other than MUTV will be allowed to talk to the United manager. It is unimaginable that any other manager will ever be allowed the treat the media with the same contempt Ferguson displayed. The Premier League maybe the most successful in the world but Richard Scudamore’s failure to stand up to Sir Alex was weak. Can you imagine the manager of, say, the New York Yankees refusing to talk to the media after games? He would last less than a minute as would the Major League Baseball commissioner. 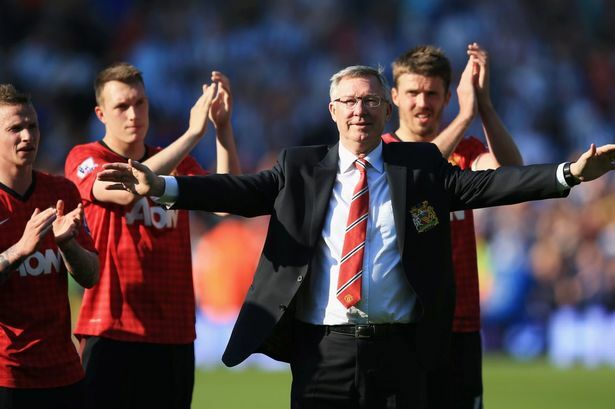 England will also benefit from the the retirement of Sir Alex Ferguson. His antipathy towards the Football Association manifested itself in his refusal to let players join up with the national team if he felt it was against the interests of Manchester United. Fair enough, United pay their wages but would he have acted in the same way if the national team had been Scotland? It was another abuse of power that the FA declined to do anything about. Roy Hodgson’s team is built around young mobile United players. Wayne Rooney (if he stays), Phil Jones, Tom Cleverly, Danny Welbeck, Chris Smalling and Wilfred Zaha will all be more available to England. 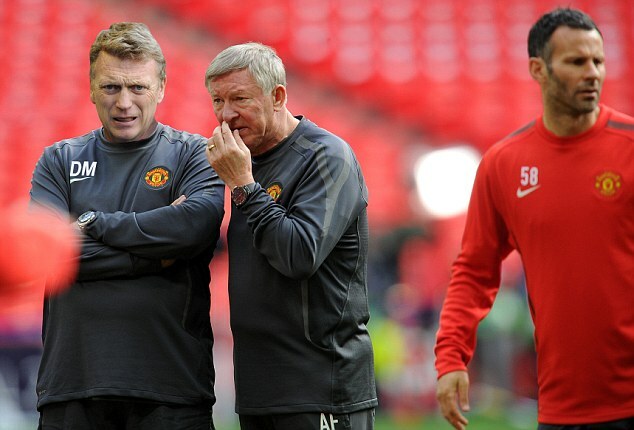 This is how Sir Alex won titles and why David Moyes will find it difficult especially in his first year. Through his success Ferguson became not just bigger than the club but more powerful than those running the game. As of now, without a single result to his name at United, Moyes is merely another dimensional manager ready to be chewed up and spat out by those his predecessor treated with disdain.